The Surface is a drama that lingers with you long after it’s over. It’s a film that captures an artistic, vibrant story with excellent imagery. Harry Hains is fantastic as your main character of Evan Jones. The performances by all involved in front of the camera and behind the scenes of the camera showcases a brilliance for the art of film making. The rich, emotional and often times moving ordeal of the story creates inside you a lasting mark. Your main focus is a young man named Evan. He is a man with no real childhood past. He was stuck in foster, after foster care, and had no stability. Now grown, he and his boyfriend Chris, are in love, but fight often over financial situations. One day, Evan goes to a yard sale of an older man named Harry. There Evan finds an old 8mm Camera. Harry tells him to come back, and he will teach Evan how to use it. Evan takes up the offer and returns. Once there, Evan meets Harry’s son Peter. Peter offers Evan some old 8mm films. Evan watches, and becomes a little obsessed with the reality of childhood, family, friendship. Soon Evan and Peter become friends, and romantically involved, causing emotional rifts in Evan as he tries to find himself, to understand friendship and family. This all creates an emotional roller coaster, spiraling and twisting the truths of life. This is a 79-minute ode to life, drama, romance, finding oneself. Discovering new things. Wishing the what if’s of life. Starring a wonderful cast of performers. Michael Redford Carney gives an utterly fantastic performance as Peter. He owned his part, and created a character that you become a part of. He captured a fantastic character in a flawless way. Next would be Nicholas McDonald did another wonderful job capturing the character of Chris. All three Redford, McDonald and Harry Hains, come together to create a very impressive film. All three played off each other, in an emotional drama that makes you believe the plight that each one is going through. Written and directed by Michael J Saul. Saul captures a moving, impressive experience for the viewer. This is his second feature length film. He has created many short films. He has a talent in creating wonderful characters, through dialogue, situations, and most of all the film flows as if one is watching a piece of life happening. 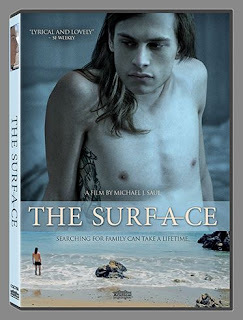 The Surface is a must see film that I highly praise, and recommend. It’s a wonderful film. It’s beautiful. Realistic. Touching. It’s leaves you with a great sense of story. It’s a film that opens a roller coaster of thoughts, ideas, moments that make you think. So many of us take for granted the idea of having families. What The Surface does is showcases a young man, longing, needing, wanting that reality that so many of us don’t even think about. The Surface is a fantastic movie about finding a family, love, emotional dramas of relationships, and the day to day reality of life. This is in my viewpoint, a must see film. Directed wonderfully. Acted amazingly by all. The pace, filming, editing, give this film a completion of perfection. The Surface is an extraordinary film.